I have another great app that I was able to review this week! 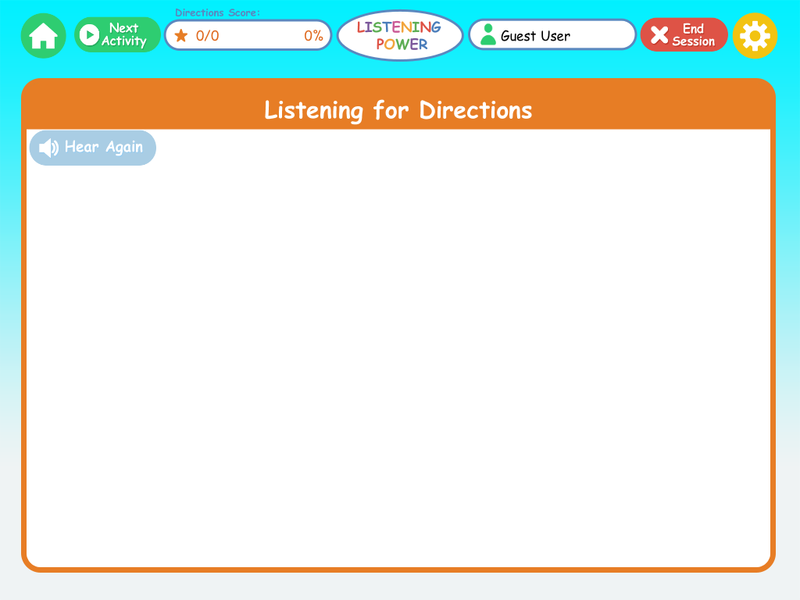 This one is from Hamaguchi Apps, and is called Listening Power Preschool. Don't let the name fool you. I am using this with my elementary population in grades K-2. It is also great with some of my older students with ASD. I am so excited to share this app with you today! I absolutely LOVE Hamaguchi Apps. I use the Fun With Verbs & Sentences all of the time. So, when I was asked to review this new app, I jumped at the chance!!!! The most exciting part is that Hamaguchi Apps has offered to giveaway not one, but TWO copies of this app! Listening Power Preschool starts out very similarly to most of the Hamaguchi Apps. You will go and select a user. You can add in your different students and then decide if one person is playing or a group of students. After I enter my players, I actually went back to the home page to select the settings. There are several different things you can play with. Activities: You can select the level and how many choices for each of the five different activities. You can also choose whether or not you want the app to automatically advance your student after a correct choice or if you want to manually advance. This is a great feature because you can talk about each item with plenty of time before the next item pops up. Answer Choices: You can have the choices automatically pop up, or you can push a button to "Show Choices." This option can also give you extra time in between the presentation of the items and when the choices pop up. Levels: This gives you the option to automatically drop or advance a level based on how many the student gets correct or incorrect. There is also a manual option to change the level. I really liked when it automatically increased or decreased difficulty for my students. Sometimes I might over or under estimate my students, and this quickly remedies the situation for me. Bubble Game: This is an incentive that students can earn after they work. You have the option to turn this on or off. You also have the option for the game to pop up after 1 activity, 3 activities, 5 activities, 8 activities, 10 activities, or 15 activities. That's a lot of options! You also have the options to track or not track progress, turn the text on or off, and also have narration and story sounds turned on or off. Now, on to the activities! These are so great! This activity targets concepts such as on, in, out, on, up, down, behind, line up, sit down, stop, underline, cross out, and more. Students listen to a direction and then choose their answer. There is a pause between the direction and the choices so that students are not looking at the visual cues while listening. This forces them to use their auditory memory skills. This activity targets adjectives such as colors, big/little, happy, sad, clean/direty, hot/cold, stripes, spots, soft/hard, round, and square. Again, students listen to the direction and then pick an answer from a choice of two, three, or four pictures. This activity focuses on plurals, verb tenses, pronouns, preposition concepts, and negation. A story is read with accompanying pictures and sound effects, followed by quesitons about the story such as who, what, and where questions. This activity is the same as above, except the student is not shown pictures during the story. The student must stay focused and imagine the story, then answer simple questions about the story. An animation after the story shows some aspect of the story. After your student is finished with this app, you can check out the data that was recorded for the session. This is all saved by date for your to use later also, which is great when doing progress reports! I think this app is very versatile! I used it with a variety of students ages 5-11. I used it with some of my older students who are developmentally delayed, and it fit their goals perfectly. I loved all of the options for choices of answers, presentation of items, and levels of activities. There isn't anything else I would want to see, because I think they really nailed this app! It's great! 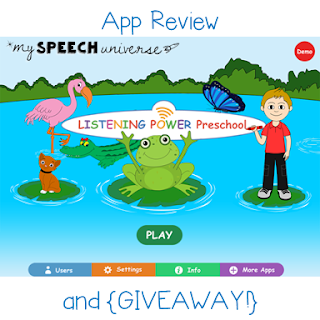 You can get Listening Power Preschool at the app store for $15.99. You can also enter to win a copy here! Hamaguchi Apps was very generous to offer not just one copy, but two copies of this app for a giveaway! Just enter the rafflecopter below by Thursday, June 18 at 11:59 pm EST for your chance to win one of the two copies of this app.